The Green Machine has been offering lawn care services since 1974. 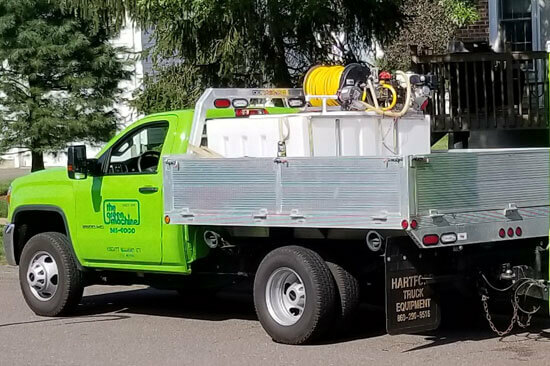 We pride ourselves on being one of the first lawn care companies in Connecticut and for maintaining a tradition of excellence for over four decades. We choose the best products available, our specialists treat your property like their own, and we provide outstanding customer service to ensure satisfactory results. * and surrounding towns. Please call our office to find out if we service your area. Lime/Annual Lime Application – Build lime into your annual program and save (compared to adding it each year). A corrective or maintenance dose of lime will be applied to your lawn based on a soil pH test. Soil Amendment Applications – Add an early & late summer soil amendment application to improve the health of your soil and help control pesky weeds. Aeration and Over-Seeding – One of the most important things you can do for your lawn, aeration reduces compaction and increases turf quality while new seed varieties help your lawn fight disease, drought, and pests.